Doris Florence Morgan was born in Acton on the 13th of August, 1906, daughter of a ‘glove cleaner’ (later a dry cleaner) Henry Morgan, and his wife, Florence. The 1911 census, at which time they were living at 34 Goldsmith Road, Acton, tells us she was ‘deaf and dumb from birth.’ George William Munday was born in 1905, son a Albert (a cabman) and Annie Isabella. The 1911 census tells us that he was ‘deaf and dumb from 1 year.’ The two were married in April, 1933. Forty people who were guests at the wedding, ten days ago, of a London deaf and dumb girl, will reassemble on Saturday at Golders Green, N.W., when the young bride is to be cremated—in her bridal gown. 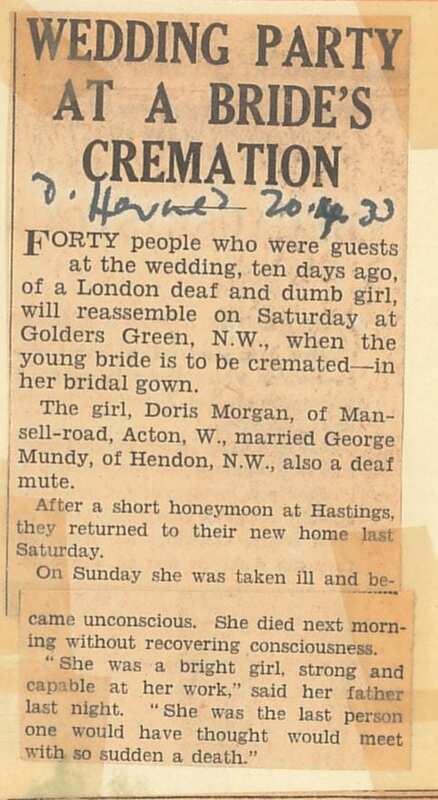 The girl, Doris Morgan, of Mansell-road, Acton, W., married George Mundy, of Hendon, N.W., also a deaf mute. After a short honeymoon at Hastings, they returned to their new home last Saturday. On Sunday she was taken ill and became unconscious. She died next morning without recovering consciousness. 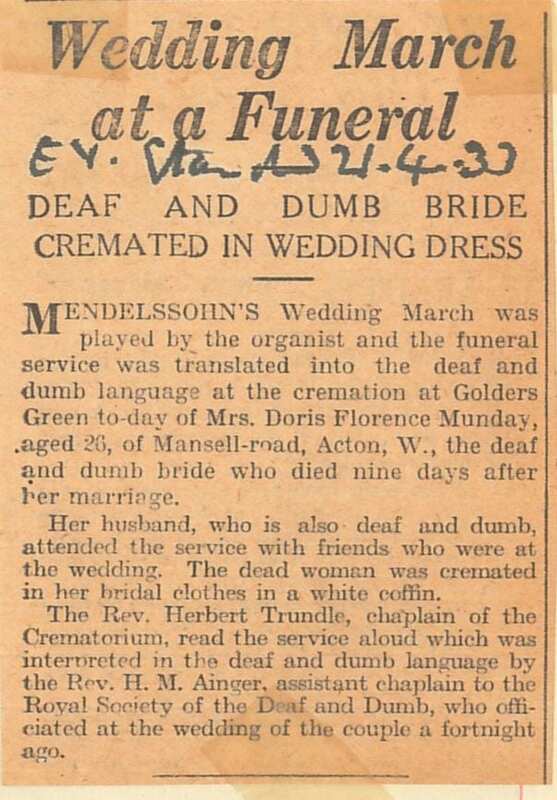 Mendelssohn’s Wedding March was played by the organist and the funeral service was translated into the deaf and dumb language at the cremation at Golders Green to-day of Mrs. Doris Florence Munday, aged 26, of Mansell-road, Acton, W., the deaf and dumb bride who died nine days after her marriage. Her husband, who is also deaf and dumb, attended the service with friends who were at the wedding. The dead woman was cremated in her bridal clothes in a white coffin. The Rochdale Mission to the Deaf was an offshoot of the Bolton Mission, which had started in 1869. 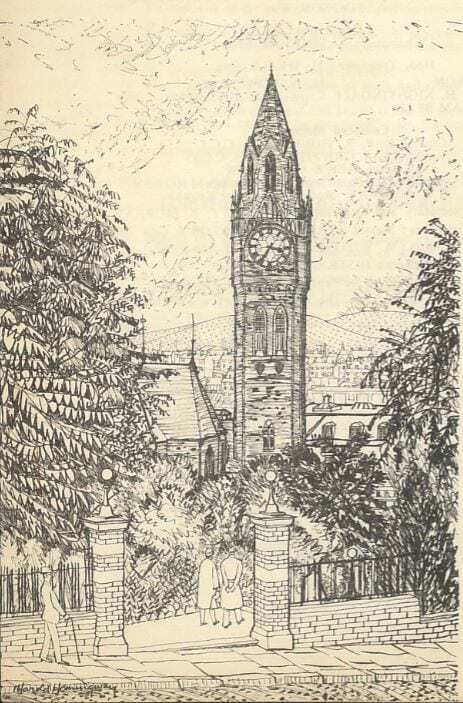 In 1907, Rochdale became a separate society, and the building illustrated here was built. The earliest mission report we have is for 1927, when the ‘Lady Superintendent and Missioner’ was Mrs Hoyle, who was still there in 1944 but had made way for Mr C. Crabtree by 1947. 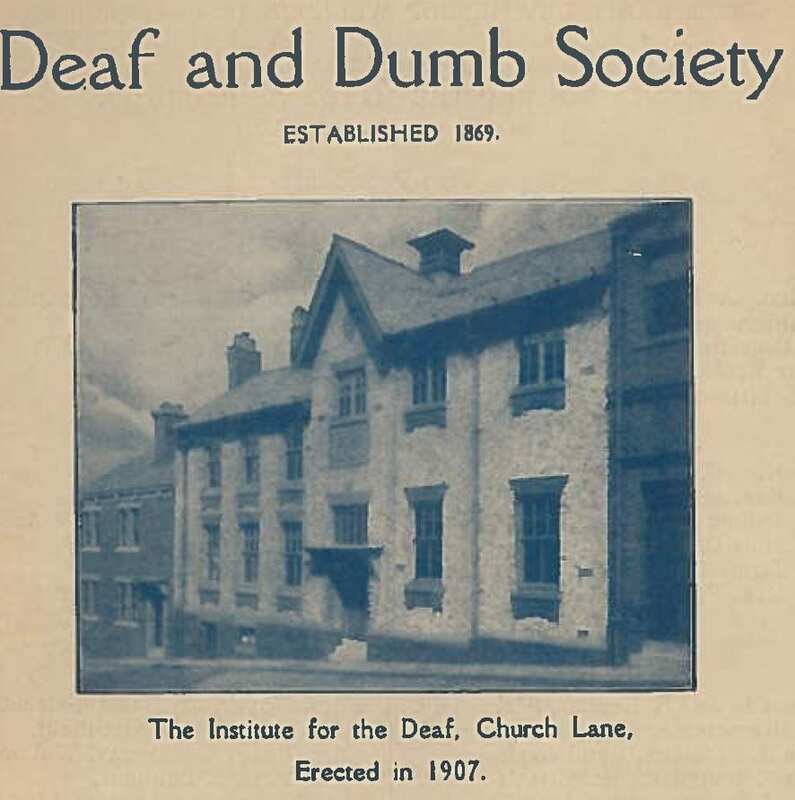 It seems that the previous year (1926) they had become affiliated with the National Institute for the Deaf, which had founded its own regional associations, including the Northern Counties Association for the Deaf. 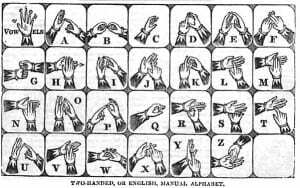 “This branch consists in the union of all the societies for the deaf in the six Northern Counties, and its object is mutual help and encouragement” (127 Report, p.2). That same year they celebrated the golden wedding of Mr & Mrs C. Birtwhistle, who were pioneers of the society. 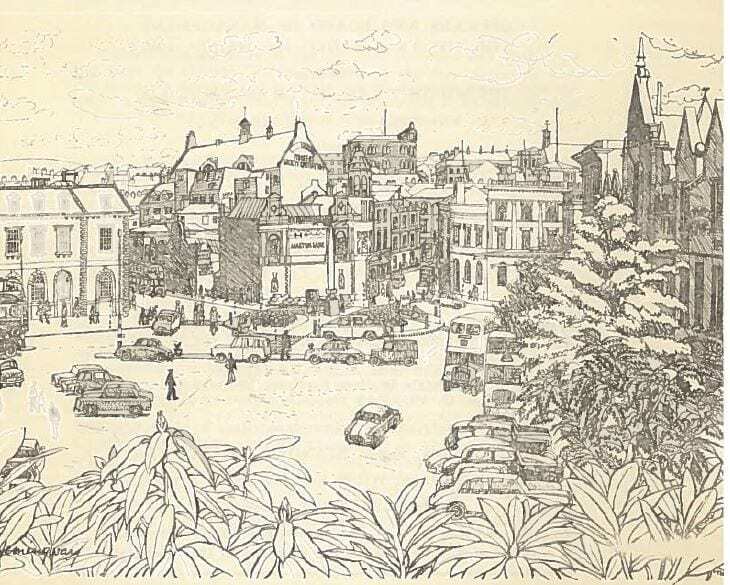 The 1960s reports have these attractive drawings of Rochdale on the covers – I think the signature is Harold Hemmingway. The 1962-3 report shows us the importance of local missions went way beyond ‘spiritual welfare’ or the social club. The Superintendent was the Rev. T.B. Murray. The word “welfare” is used here as a general term. covering a wide range of services for the deaf, from advice in filling in forms to extensive case work with problem families. 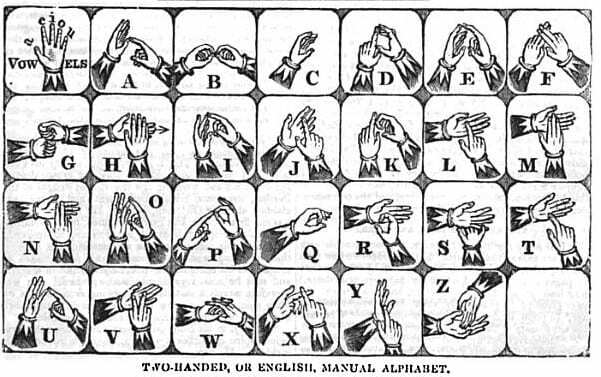 It would be impossible to mention every detailed piece of work which might be included under this heading so the following paragraphs are intended merely to outline the different types of problems encountered in welfare work for the deaf. The complicated set-up of present-day social services means that all social work agencies have as an important function the interpretation of these services to the general public. The deaf general public, like the hearing. often do not know what help is available for a particular need, nor how to set about applying for it, but three consequencies [sic] of their disability further complicate matters for the deaf. Firstly, the difficulties of communication often prevent them from making use of the services even when they know they exist. Secondly, as a result of their limited education, they are often poor writers and readers, unable to cope with letters, papers and forms. And thirdly, as a consequence of their inability to understand and be understood by hearing people, the need for interpreting extends to more aspects of life than the social services. Religious and civil ceremonies, business transactions, legal work and many other matters have to be interpreted in two senses, i.e. the meaning has to be explained and the whole translated into language the deaf person understands. We have reports for 1927-34, 1936/7, 1943/4, 1947-52, 1955-1966. Edward Bates James was born in the Commercial Road, East London, on March the 5th, 1863. His mother, Isabella Dorothea Bartlet, born in 1839, was a pupil at the Old Kent Rd School – you can see her named there in the 1851 census as Bartlett. His father Edward Francis James (b.1826) was in business, having once been a servant, but although not mentioned by Gilby in his memoir, the 1881 census says he was sexton at St. Saviour’s Church when he and Edward were living at 272 Oxford Street. His parents had married in 1862. His mother was an upholstress in 1861, when she was living with her widowed mother at 150 Tottenham Court Rd – approximately where the Cafe Nero is opposite Sainsbury’s. Owing to the fact that his mother was deaf and dumb, he used to accompany her to all meetings at the old Polytechnic in Regent Street, the last Mission Centre in London before St. Saviuor’s was built. There he used to meet those, early in London history of deaf work, who were active in the religious and social welfare of the Deaf, especially Samuuel North and the Rev. Samuel Smith, and the latter was a frequent visitor at his parent’s’ home. When quite young he used to interpret in court cases, and assist in the missions (Ephphatha, 1936, p.1849). 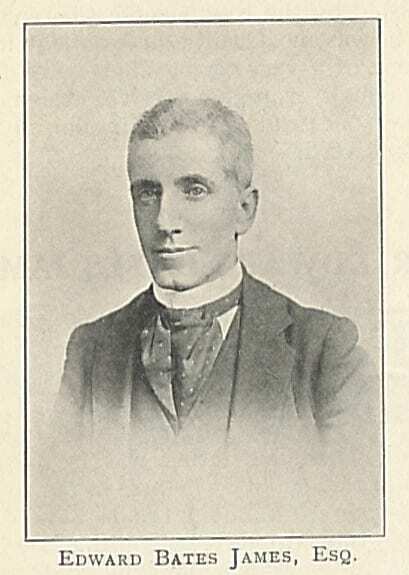 Later on he became a teacher of the deaf, training with William Neill at the Northern Counties School for the Deaf in Newcastle. The Ephphatha article tells us he regarded Neill with a mixture of “awe and admiration,” and he would never forget the “good caning of half a dozen big fellows late at night for some wrongdoing,” administered by Mr Neill (p.297). The article does not tell us when he left, but at some point he returned to London on the death of his mother. He worked, we are told, “in the City in the day, spent a good deal of his time in deaf work, and saw St. Peter’s School, Islington, first opened for them” (ibid). I have never heard of that school – was it a proper school or only a Sunday school? He also carried on services at Morley Hall in the absence of Jane Groom. His ‘City’ work would have been as an accountant or accountant’s clerk, according to census returns. Marrying in 1889, his wife Ellen bore two children but died after only three years of marriage, on their wedding anniversary, which meant he had to withdraw from some of his mission work to look after his sons. One of his sons was Walter Melville James – perhaps named after Alexander Melville? His other son was Alfred. His wife, Ellen James, who was ten years older than him, was like his father was born in Kettering, which suggests she was perhaps a cousin – I have not had time to conform this. in the matter of success in finding work for the deaf he has probably had no equal; and the friendliness and suffering, perhaps in many cases not well skilled, have had great cause to bless him for opportunities afforded them of getting their living. His heart has always disposed him to help again and again those who truly do not deserve it – and who, under his superintendence, have become self-supporting and something like industrious people. His has truly been a work of rescuing the perishing, and though often disheartened by the downright wickedness and perversity of some of his cases, he has never turned back or entirely despaired. On leaving North London recently to become the right-hand man of the Chaplain at St. Saviour’s, he was presented with a gold chain and illuminated address containing signatures by old friends who valued his earnest and helpful ministrations and admired his faithful devotion to duty. He seems to have taken on a lot of Gilby’s work when he was ill during the Great War. He died on Sunday, the 9th of February, 1936. Gilby only mentions him in passing, saying of him, ‘more anon,’ but only then mentions seeing him before going to South Africa in 1934. They may well have been acquainted since childhood. He was buried in Brookwood cemetery, Woking. *The obituary says 1905, but Gilby’s memoir says 1904. there were however several bazaars around that time. 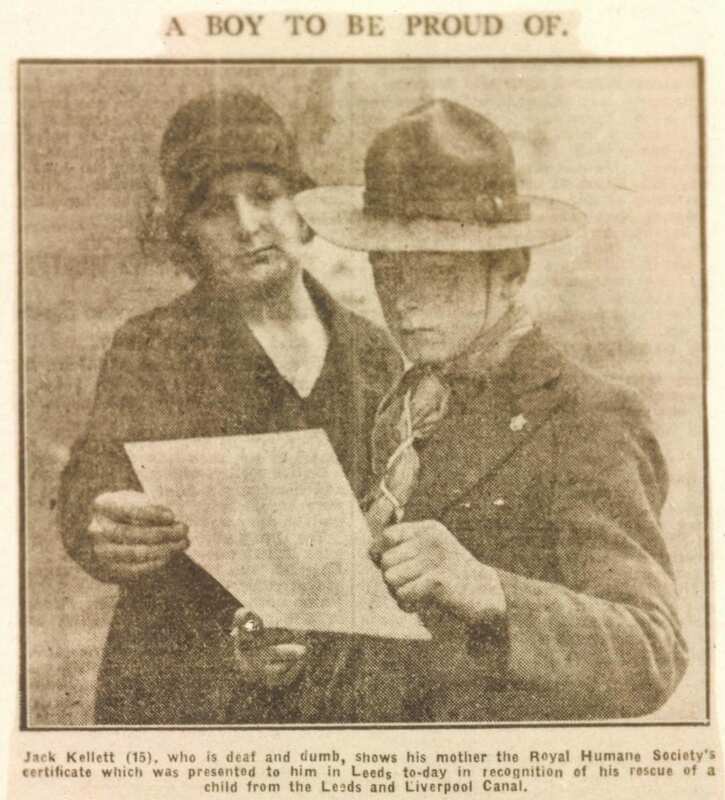 In around 1928 (I am not certain of the date) Jack Kellett of Water Street, Holbeck, a deaf scout from the Leeds 14th South-West Troop of Boy Scouts, was walking along the Leeds and Liverpool canal bank in Globe Road having been for a swim. Another child pointed out a boy, George Henry Wright aged 4, who was struggling in the water. Jack dived in, grabbed the boy’s coat, lifted his head from the water, swam with him to the bank and then pulled him out. He immediately began artificial respiration until further help arrived. The boy recovered, and Jack, who had learnt life-saving and swimming in the scouts, was given the Royal Humane Society’s Testimonial certificate, presented to him by the Lord Mayor, Alderman David Blythe Foster. The deed was very fine and brave. I am glad to know that you can swim. That is one of the things I cannot do and I am now too old to learn. I hope that all the girls and boys of the city will learn to swim, so they can render service in case of emergency, as you have done. Jack would have been born around 1913 but I have not found him on the Free BMD website. Perhaps ‘Jack’ is not his proper name. There is a challenge there for someone to find out more about Jack, his family, where he went to school and so on. Perhaps someone remembers him? Kellet seems to be a common name in Leeds so there may well be relatives. The Royal Humane Society‘s records are now in the London Metropolitan Archives and would certainly be interesting to check. Finally, it is really curious to note that I have come across a number of examples of Deaf people rescuing others from drowning. There is a fascinating article on “Heroic rescuing behaviour,” which says, “Males with low socio-economic status were more likely to rescue in all the contexts (fire, drowning, violence and traffic accidents).” The article links such behaviour to evolutionary theory. I found the article on ResearchGate. This post is based on a photograph of a newspaper cutting of unknown date. Some time since, in Glasgow, a woman, named Jane Campbell, alias Byrne, [sic] with an infant on her back, was observed on the bridge, leaning her shoulder against the battlements; shortly after, some person heard a heavy fall of something into the river. It was her child – it was drowned! She was apprehended, on suspicion of having thrown it over intentionally. She was deaf and dumb and was brought to trial with strong evidence against her. She had never been taught anything; no one could understand her until Mr. Kinniburgh, the master of the Edinburgh School for the Deaf and Dumb, was sent for – he understood her. She made signs that her child had been supported on her back her cloak, the ends of which she held in her hands, drawn tightly across her breast. Wishing to take some money out of her bosom, she forgot the child for a moment, and incautiously let go her hold of the cloak; the child fell out on the top of the parapet, and rolling over it into the water, was hurried away and drowned. When he made signs to her, that people thought she had done it intentionally, and had thrown the child in; she expressed the utmost abhorrence of the supposition, and the sincerest regret for the child. She had been betrayed and deserted. She expressed the greatest indignation against her betrayer, whom she considered as her husband; but he was unknown, and she could not explain by signs how he could be discovered. Mr. Kinniburgh gave it as his decided opinion, that she was not guilty of the crime imputed to her, and she was accordingly acquitted. Fortunately, this happened in a country where the laws are executed in equity, where the innocent are protected, and even the guilty given the full benefit of investigation; but had it occurred in some foreign clime, where tyranny reigns, and individual rights are unregarded, the rich protected, and the poor despised, and even involuntary ignorance and accidental crime unpitied, she might have suffered a terrific sentence, and the life of a fellow-creature, whose situation excites the most poignant feelings of sympathy, might have been offered up a bloody sacrifice, upon the detested altar of villainy. If there had not been there ‘an interpreter, one among a thousand, to show unto man her uprightness,’ she might have found that ‘none that would be gracious to her,’ and say, ‘deliver her from going down to the pit.’ You shudder at the thought, prevent then the possibility of any Irish deaf and dumb female being exposed to such deception, danger, desertion, widowhood, by promoting the power of; this Institution [Claremont] to educate all that apply. In fact, the pre-trial proceedings are equally as interesting as the trial. 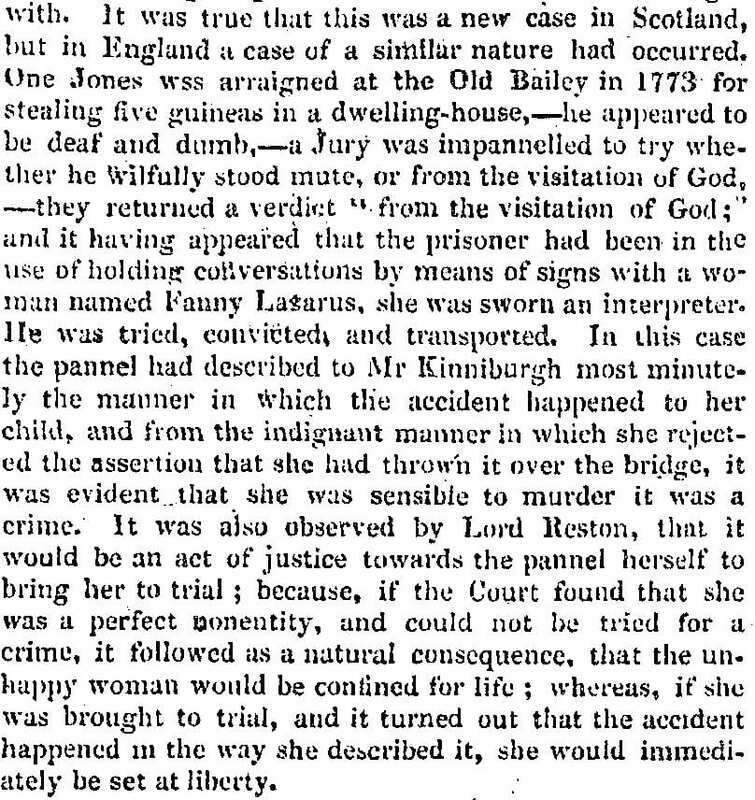 Kinniburgh was brought in to try to interpret for the pannel and the court. The ‘pannel’ (a Scottish legal term for the accused) was accordingg to Lord Hermand not fit for trial. Lords Justice Clerk, Gillies, Pitmilly, and Reston were of a different opinion, saying that she was doli capax that is capable of deceit, and having knowledge of right and wrong, quoting a case in England from 1773 (see below) where a jury had to decide if the accused man was wilfully mute or “mute from the visitation of God” and a woman who knew him acted as a sign interpreter. Lord Reston opined that it was in her interests that she should stand trial as if she was found a ‘nonentity’ she would be ‘cont[a]ined for life’ whereas if she were tried and innocent she would be at liberty. It is important to note that she was not found ‘not guilty’ but ‘not proven’, a verdict in Scottish law where there is evidence against the defendant but insufficient to convict. After the trial Kinniburgh helped her to travel back to Argyll where her family lived. It would be an interesting project to try to discover what became of her and her surviving children. Caledonian Mercury (Edinburgh, Scotland), Saturday, September 27, 1817; Issue 14971.